We’re giving out TONS of prizes for March, April, and May! Excited? You better be! Parents should enter on behalf of students! To enter, log into the entry form below and complete at least one social media action to enter. You can gain extra entries in the drawing by completing additional social media actions. Only one entry per person, per entry period. For additional terms and conditions, see below entry form for details. Good luck! 23 Winners will receive 2 Tickets each to a private showing of Avengers: Endgame during opening week! Winners will be chosen by social media activity. Giveaway is open to U.S. residents ages 18 and over with a Twitter, Facebook, or Instagram account. You will be automatically opted into our newsletter when you join. 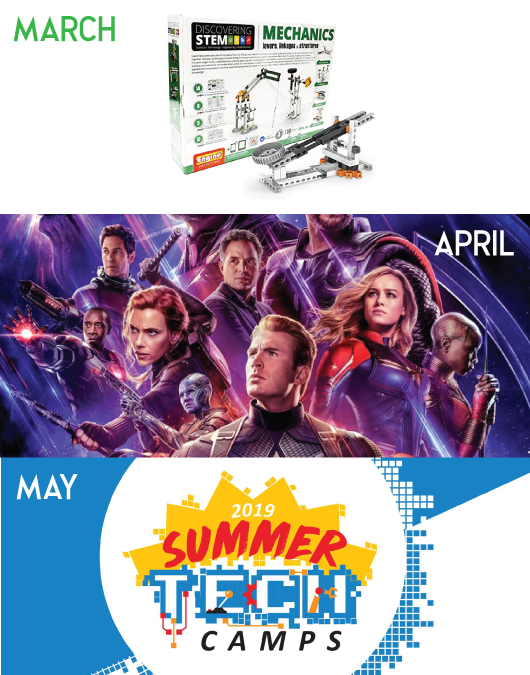 April: 23 winners will receive a pair of Avengers: Endgame tickets to a private showing sponsored by AccelerateKID® opening week. Tickets are not exchangeable for cash, or other goods. Tickets are only valid for the private showing on April 28th, 1:30PM at Emagine Novi – Auditorium 7. 44425 West Twelve Mile Rd., Novi 48377. Popcorn and drinks are not included. Movie begins at 1:55PM. It is recommended to arrive earlier. No trailers will be shown before the movie. The movie will last 3 hrs – 2 min. First 20 winners will receive regular recliners. The last 3 will receive “cuddle couch” seating. The voucher will expire 2 months after issue and is non-transferable. All camps run for 5 consecutive days (Mon-Fri), 9am to 4pm. Vouchers are redeemable to be used only at AccelerateKID®’s two centers in Wixom, Michigan and Madison Heights, Michigan. To Enter: Entrants must log in via GLEAM and complete at least one social media action to enter–this is the ONLY mandatory task. You can gain extra entries in the draw by completing additional social media actions. Only one entry per person, per entry period. The winner will be chosen by social media activity. The winners will be informed by email within 7 days of the closing date, and must respond within 7 days to claim their prize. AccelerateKID® is the sponsor of this giveaway and is responsible for prize fulfillment. The prize will be dispatched by e-mail and delivered within ten working days of receiving the winner’s contact address details. Winners names available upon request. The number of eligible entries received determines the odds of winning. Void where prohibited by law. No Purchase Necessary.